The Riksbank has a 2% inflation target, so clearly they are missing on the low side. Of course, given the typical wishful thinking of central bankers, you can see from the chart that they are forecasting that they will hit the target a year from now, and exceed it later in 2015 and 2016. The deflation has been caused by the Riksbank’s tight monetary policy since the summer of 2010. So, in the last two charts, you can see that the downturn in Sweden during the recession was larger, but the recovery was stronger than in the US, with Swedish real GDP returning to its pre-recession level earlier than in the U.S. 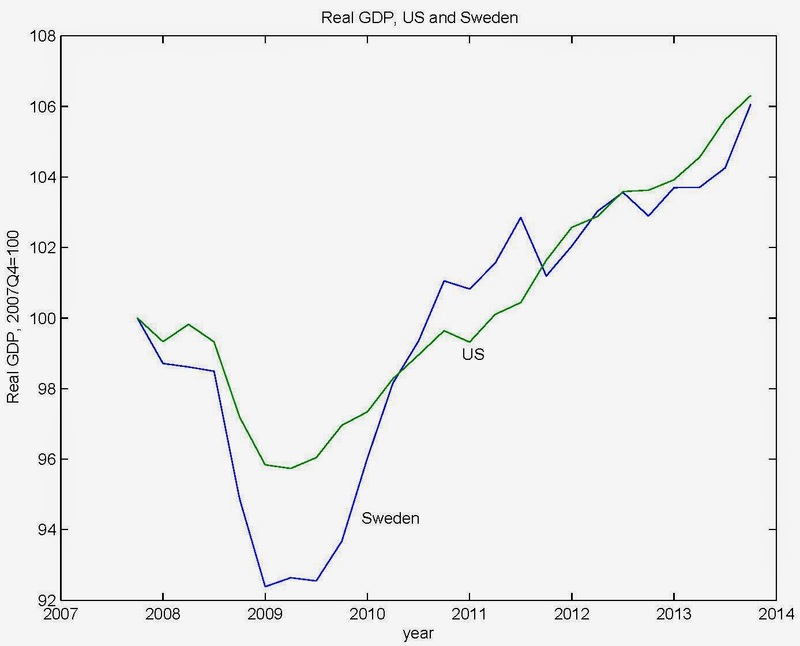 But there has been lower growth in Sweden in 2012-13 so, relative to 2007Q4, the US and Sweden are in essentially the same place. Monetary policy needs to remain highly expansionary to contribute to inflation rising towards the target. Although inflation has been somewhat lower than expected, only a minor revision has been made to the inflation forecast. The Executive Board of the Riksbank has therefore decided to hold the repo rate unchanged at 0.75 per cent. It is judged appropriate to begin gradually raising the repo rate in one year's time, when inflation has picked up. As economic activity strengthens, inflationary pressures are expected to rise. However, it is uncertain how quickly inflation will rise, particularly as it has been weaker than expected for some time now. The repo-rate path has therefore been adjusted down somewhat and reflects a greater probability of a repo-rate cut in the near term compared with the assessment made in February. That's from a section titled "Low Interest Rate Until Inflation Picks Up." Clearly, if inflation remains low, the policy rate will remain low. Deputy Governor Lars E.O. 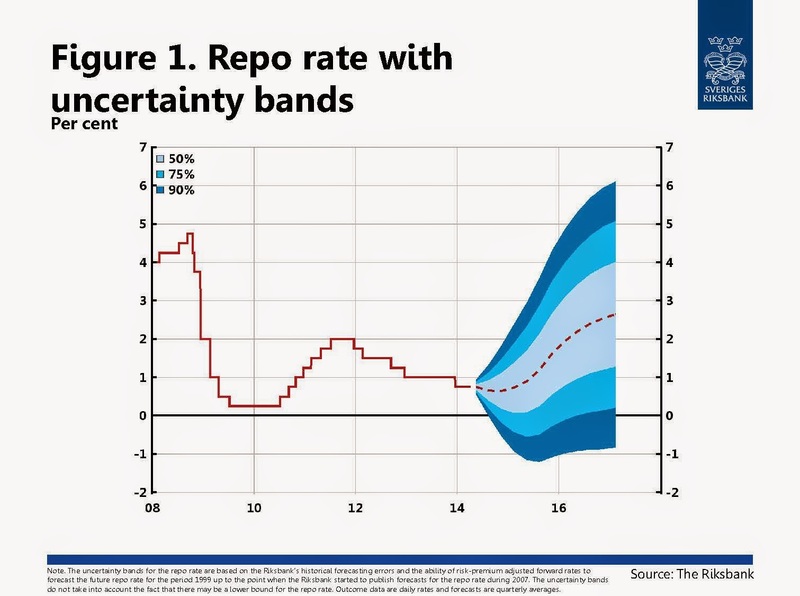 Svensson entered a reservation against the repo-rate path and advocated a repo-rate path with a repo rate of 0.25 per cent through the fourth quarter of 2010, and thereafter a gradual return to the repo-rate path of the main scenario. Lars E.O.Svensson maintained that such a repo-rate path results in a better outcome for both resource utilisation and inflation, with both lower unemployment and CPIF inflation closer to the target. After leaving the Riksbank, in September 2013 Svensson wrote this post, in which he claims that, if the Riksbank had not only done what he had recommended in June 2010, but kept the policy rate at 0.25% until the current time, the inflation rate would be at the 2% target, and unemployment would be lower. In Svensson's September 2013 post, it is not clear to me what model he used to come up with his counterfactual, but suffice to say that, whatever the model is, it tells us that a short-term real interest rate of -1.75% can be sustained for 3 1/2 years, which seems goofy. One thing I would be interested in seeing is the output this model produces under the actual path for the policy rate. My guess is that it predicts inflation well above what actually occurred. Off the top of my head, I would say that, under Svensson's policy scenario, the inflation rate would currently be lower, and the unemployment rate would be about the same as what we're actually seeing in Sweden now. Of course, this is just quibbling over history. 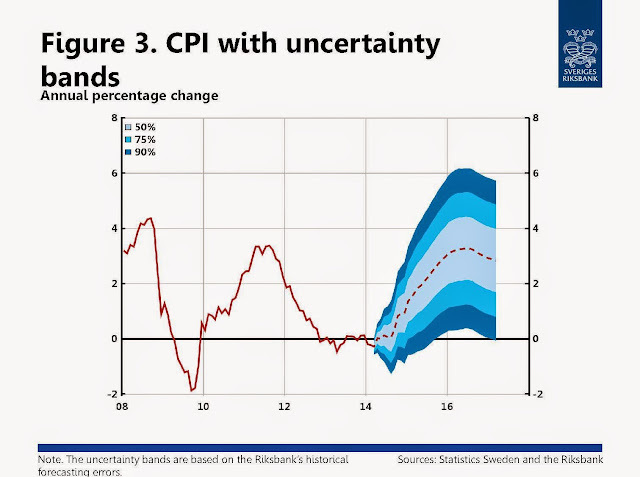 What does Svensson think the Riksbank should do now if it wants to hit its 2% inflation target? The most important thing is that the Riksbank takes the inflation target seriously and stops neglecting it. In order to get inflation back to target soon, the policy rate has to be lowered quickly to 0.25 percent or even zero. If this does not help, the Riksbank – as other central banks at the zero lower bound with too low inflation and too high unemployment – will have to use unconventional (but by now frequently tested) policy measures. These include a negative policy rate, large-scale asset purchase to lower long interest rates (quantitative easing), a low policy-rate path for a longer period with different variants of “forward guidance”, foreign-exchange interventions to depreciate the currency or at least (as in Switzerland) prevent it from becoming too strong, and to aim to overshoot the inflation target for a few years. By now, it should be well known that Taylor rules have some very undesirable properties. In particular, a central bank which follows a Taylor rule blindly can get stuck in a policy trap, in which the policy rate is at the zero lower bound, and inflation is low or negative. The central bank wants higher inflation, and thinks it will achieve this by lowering the policy rate, which is not feasible, so the policy rate stays at the lower bound and - given that the Fisher relation holds in the long run - inflation stays low or negative. This is the policy trap that Svensson's advice would lead the Riksbank into. In Sweden, the Riksbank cannot consistently meet its inflation target of 2% if the policy rate stays low or goes to zero. The Fisher relation guarantees that. In order to meet its inflation target, the Riksbank has to increase the policy rate - there's no other way to do it. In addition to the standard Taylor-rule policy-trap problem, there are two elements of Svensson's unconventional policy recommendations that further exacerbate the problem, in terms of how Svensson looks at it. First, if QE works in the long run the way I've modeled it, then it will ultimately produce less inflation, not more, if the policy rate stays low or at the zero lower bound. Second, consider Svensson's "negative policy rate" recommendation. This appears to be a variant of the idea that, if our problem is a binding constraint on the nominal interest rate at zero, then we should relax the constraint by somehow taxing the liabilities of the central bank. Miles Kimball loves this idea. Basically, the central bank could tax reserve accounts, and there are schemes that might allow taxation of currency or its electronic replacement. Basically, people who advocate for taxes on central bank liabilities as a means for increasing inflation are making the same error as are people who are concerned that the currently large stock of reserve balances in the United States might ultimately produce more inflation (a group of people that may or may not have once included yours truly). For example, you might think that, if you tax central bank liabilities, then people have less inducement to hold those liabilities, and inflation results due to some kind of hot-potato effect. Similarly, you might think that, as assets other than money become more attractive (as the economy recovers and real returns rise), that inflation might rise, for a similar reason. Well, that logic is wrong. To induce people to hold central bank liabilities when the nominal interest rate has been at its lower bound for a long period of time, the inflation rate must be sufficiently low, so that the real return on money is sufficiently high. If we tax central bank liabilities, or the real returns on alternative assets are higher, the inflation rate must be all the lower in the long term, in order to make central bank liabilities sufficiently attractive that people will hold them. So that doesn't give the dramatic story I thought it did, i.e. 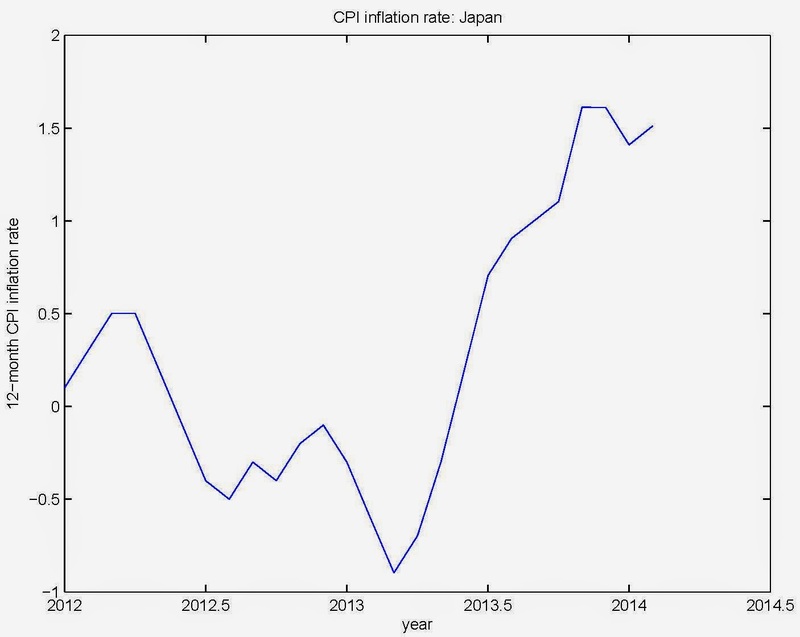 year-over-year inflation is still up around 1.5%, though short of the Bank of Japan's 2% inflation target. Note as well, that if we look at the levels, in January the CPI fell, and there was no change in February. 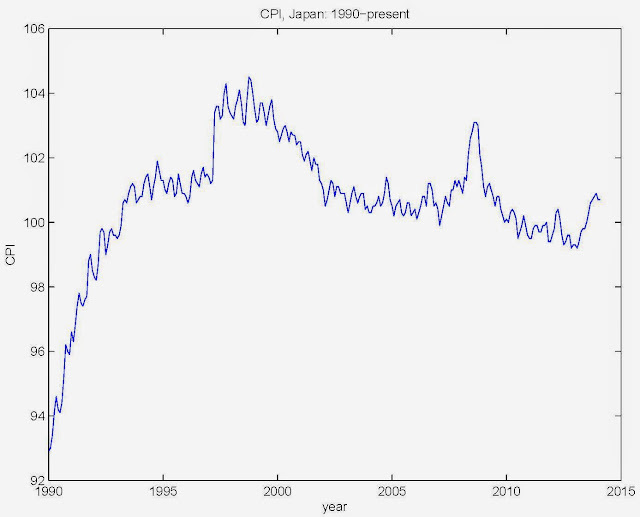 So, in spite of the recent blip in inflation, the average rate of inflation in Japan over the last twenty years is about zero, and in that 20-year period we have seen other short bursts of inflation. 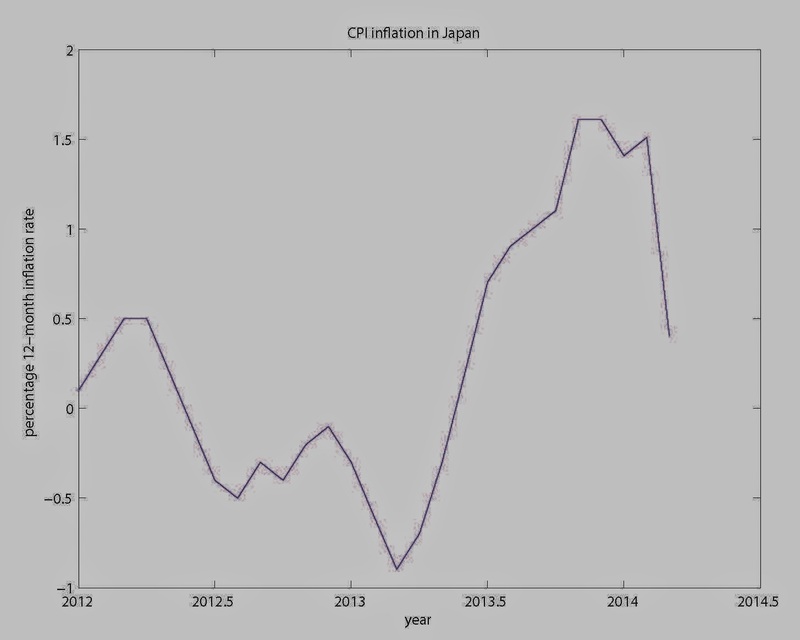 Thus, the Bank of Japan seems to have had some difficulty in producing inflation - but this time may be different. Given that the Bank seems intent on holding the short-term nominal interest rate at zero (essentially), I don't see it, but I'm curious to see how the data unfolds. In late 2010, Sweden had just about recovered its late-2007 output so it was still a long way below trend. If potential output grew according to trend, then a simple Taylor would suggest keeping interest rates lower for longer. Is the argument for increasing interest rates in 2011 that potential output did not grow between late 2007 and late 2010? If we think that potential output did grow, then what is the rationale for increasing interest rates by 2 percentage points? 1. What's potential? How are you measuring it? 2. To me, the rate hikes look like what central banks typically do under those circumstances. I'm not sure about whether this is optimal, but to me it looks to be within the bounds of New or Old Keynesian thinking. Let me rephrase the claim: in late 2010 inflation was below 2% (the target) and unemployment was 2% above pre-crisis levels and therefore a Taylor rule would not prescribe a 2 percentage point interest rate increase. In other words, a rate increase is not what central banks would typically do under these circumstances, at least under this simple Taylor rule. Do you have a more sophisticated model of central bank behavior in mind? This is what I couldn't follow. I am also not making any claims about optimality. The way central banks, including the Fed typically do this (and let me emphasize that I'm not endorsing it) is to think of the Phillips curve in forecasting terms. 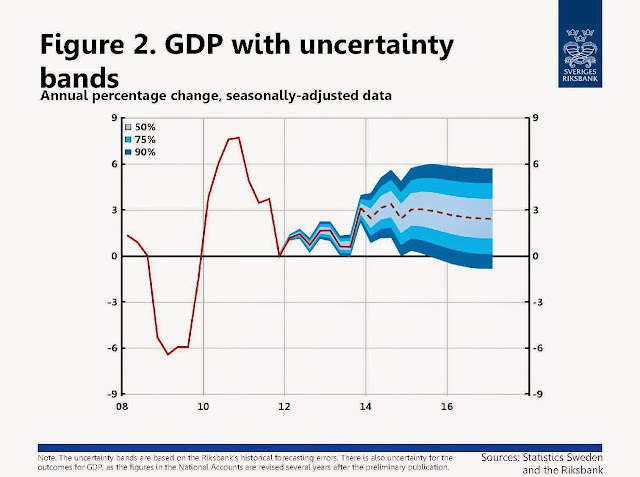 In mid-2010 the growth rate in real GDP was really high, so the Riksbank was thinking the output gap was shrinking fast, and that made them think (in typical Phillips curve fashion) that they should expect higher inflation. So they started raising the repo rate in anticipation. Sure enough, by late 2011, the inflation rate is well above the 2% target. But they stopped tightening, and indeed began easing given the weakness in GDP growth. So, that looks typical to me. Again, a 2% policy rate is not particularly high given the state the Swedish economy at the end of 2011. "If we tax central bank liabilities, or the real returns on alternative assets are higher, the inflation rate must be all the lower in the long term, in order to make central bank liabilities sufficiently attractive that people will hold them." You are making it sound as if the tax will cause lower inflation. In the previous sentence you are decribing an outcome without any causality. Can you describe the mechanism that leads taxes to lower inflation? It's just the Fisher relation. It has to hold in the long run. But, if you like, if the tax rate permits the central bank to lower the nominal rate below zero, and the central bank reduces the nominal rate to its new lower bound permanently, then effectively the tax rate has caused inflation to be lower in the long run. The model used for the counterfactual experiment is the Riksbank's standard empirical DSGE model, Ramses. There is an update of the experiment here, including 2013: http://larseosvensson.se/2014/02/06/ekonomistas-unemployment-and-monetary-policy-update-for-the-year-2013/ . The red lines show the actual outcome. The blue lines show the counterfactual outcome. By the way: I am not advocating using a Taylor rule. Instead I prefer "forecast targeting", that is, setting a policy rate and a policy-rate path such that the corresponding forecasts of inflation and unemployment "look good," meaning that they best stabilize inflation around the target and unemployment around a long-run sustainable rate. There is much on this on my website, larseosvensson.se. A recent paper on lessons from my 6 years of policymaking is this: http://larseosvensson.se/files/papers/Svensson-paper--Some-lessons-from-six-years-of-practical-inflation-targeting.pdf . Thanks, Lars. I've sometimes wondered about how forecasts are used in the policy exercise. Sometimes people will treat the forecast as if it is another piece of information, but of course we forecast given what we know about the current state of the world, so that can't be true. And what happens if the forecasting model is wrong? Surely every model is wrong to some extent, and in the current context, in which the data appears to be at odds with standard Phillips curve correlations, that seems particularly problematic. Given that the majority wanted to justify a high policy-rate path, there was a strong temptation to exaggerate inflation risks. Why a negative real rate for three years is goofy? What is the deep parameter that tells us that the real rate on monetary assets should be positive? Who said it needed to be positive? The FED has been "deeply" into unconventional policy? Looking at the slow recovery, it does not look deep enough. In your own experience, if something doesn't work, does doing more of it help? If something *does* work, doing more of it may not help. Finding the mechanisms for your approach to the Fisher relation is a deeply complicated process. Take this scenario for instance... the Fed in normal times all of a sudden decides to raise the Fed rate to 12% and leave it there forever. In the short run, the real rate would rise, inflation would fall, real output would crash. There would be a mess. But the Fed doesn't flinch and holds the Fed rate steady at 12% into the long run. Then I imagine the adjustments that as the economy recovers to bring the real rate back to 2% to 3% assuming that it is invariant to monetary policy in the long run. How would inflation find its way back to 9%? How would wages be settled? How would prices be settled? It's an incredibly messy process, but underlying the whole process is a guiding message... The Fed rate will be 12%... That means that inflation will have to be 9% into the long run, because the economy naturally grows at a 2% to 3% rate considering innovation, capital accumulation, growth in the labor force, etc. So people just simply start incorporating into their contracts this message that inflation will have to rise to 9%. In the aggregate, people will gradually bargain for embedded higher prices in order to lower the real cost of financing, until the inflation rate reaches 9%. And now we have a situation where the Fed rate is projected to be below its natural nominal rate by at least 2% into the long run. This means that with a 2% inflation, the real rate will always be 2% below its natural level. So do we now expect contracts in the aggregate to embed lower inflation to raise the real cost of financing? Why not? A contract has two sides looking for a balance irrespective of the macro reasons why the Fed rate is low. Once into a low interest rate contract, embedding lower prices is a bargaining tool while still getting a decent real rate of return. Is this how you see the mechanics for the Fisher relation in the long run? My sense is that you are correct and proving it is going to be a fierce battle. Many top economists will have to give up their stand for loose monetary policy. That will not be easy. Even when they realized that potential output was less than originally thought, there was no backing off of loose monetary policy. The reaction was to double-down and keep pushing beyond the lower potential output level. My sense then is that your idea of the Fisher relation will be opposed by the idea that inflation will rise as real output gets closer to its natural level. I do not agree that it will. I think there is stubborn low inflation because the monetary expansion is bifurcated. You and I see stubborn low inflation for different reasons. Maybe they are connected. I also do not agree that Sweden's higher interest rate led to the low inflation. I compared Sweden to Norway. Norway has 2.6% inflation and had even higher interest rates for longer. There is another mechanism at play, which seems related to "loans to private sector". Norway had better growth in loans even with a higher interest rate. Maybe the banks in Sweden are sick. In such a case, wouldn't higher interest rates benefit them? "Finding the mechanisms for your approach to the Fisher relation is a deeply complicated process." No. I've written these things down formally. Not with all the short-run effects you might want to think about, but the theory is there. And the basics are just standard monetary economics. Nothing fancy going on. 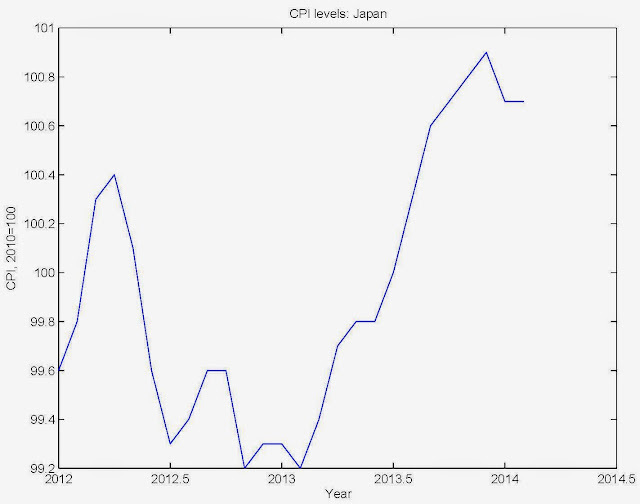 "the idea that inflation will rise as real output gets closer to its natural level." 1. What determines that "natural level," and what is it right now in the United States? 2. Seems that Keynesians would say that output has been increasing toward that natural level for the last 2 years. Why is inflation falling? By, the way, I'm puzzled why you think it's weird to take seriously the long run implications of the Fisher relation, which is at the core of essentially all mainstream monetary economics, while proposing some "monetary bifurcation" theory of inflation. I'd like to see you formalize that. The long run Fisher effect is not at all weird. I agree with it. Yet, other progressive economists will say you are wrong because they will not accept a rise in the Fed rate. They fear a premature recession. I would link to my work on the natural level of potential GDP, but the server for my blog, typepad.com, is offline due to some kind of hacker attack. If my blog ever comes back up, you can do a search on effectivedemand.com for potential GDP. Briefly, right now the natural level of real GDP in the US is between $16.050 and $16.100 trillion.This is based on a calculation of effective demand which limits the business cycle. Effective demand is determined by labor share, which will limit the utilization rates of labor and capital. The recent drop in labor share has pushed the natural level below the previous full employment level. I see a NAIRU between 6.3% and 6.7%. I would say that inflation is falling due to low relative labor income from low labor share. Monetary expansion is taking place among higher incomes, but not among lower incomes. Yet, there are forces pulling down labor share, like from China where labor share dropped substantially from 1997 to 2007. The drop in labor share in China put pressure on the US to do the same. Inflation stayed low in China in spite of large capital inflows. Inflation is muted in the US as well. But there are consequences for effective demand when labor share drops. The biggest consequence is a drop in potential output. So a summary... crisis hit, Fed rate went to zero, economy started to recover, yet labor share fell dropping potential output, Fed did not see this, Fed saw a much higher potential output, so their Taylor rule showed a negative Fed rate, when in reality, with a lower potential GDP or even a higher NAIRU in the Taylor rule, the Fed rate comes out positive. Since then the Fed counts on the wealth effect to spur spending, However monetary expansion bifurcated giving liquidity to capital income but not labor income, inflation stays muted and low... and then the Fed says that the Fed rate must stay on ZLB trend in order to reach the "false" CBO potential GDP... Fed forecasts a negative real rate to take us to full employment... but really a positive real rate will get us to full employment. With the Fed rate on ZLB trend for so long into the future, your Fisher effect comes into play embedding low inflation which was already muted by low money expansion among labor income. The real natural rate looks to be around 2%. Real GDP is reaching its natural level of $16.100 trillion. With an inflation of 2%, the Fed rate should be closing in on 3% fairly soon. The Fed should have started to raise the Fed rate around 2 years ago. And it should be at least 2% by now. The Fed does not realize that the LRAS curve has shifted down due to lower effective demand. So they are way behind the LRAS curve. So, your work on the Fisher effect is immensely important and I sense there are "Fisher" forces raising the real rate toward 2%, while other forces, like forward guidance, try to push the real rate lower. Yet, the Fisher effect supported by the bifurcation in monetary expansion is winning the battle over the real rate. 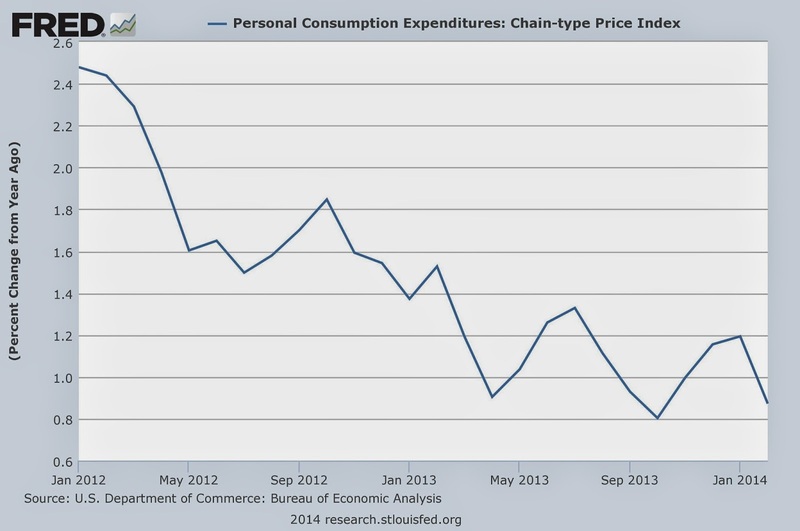 So like you, I see inflation staying stubbornly low for quite some time. I do see pressures to raise wages. But so far there is not enough to raise labor share, which is the critical component to change potential utilization of labor and capital. As well, I think it is too late in the business cycle to substantially raise labor income. Profit rates are already peaking, and if the push to raise labor income is too strong, there will be an economic contraction. To wrap up, I agree with you. Getting the Fed rate off of the long run ZLB trend would open the door to higher inflation. But the global economy is fragile. Emerging markets fear a higher Fed rate. The debt servicing costs of the govt would rise. The stock market would contract. Yet, accepting all that stress, the economy would be healthier. "Yet, other progressive economists will say you are wrong because they will not accept a rise in the Fed rate. They fear a premature recession." Exactly. The fear is overblown. As usual, there's a tradeoff. You get to have inflation at the target rate of 2% (which we're assuming is optimal) forever, weighed against whatever short-run costs we face due non-neutralities of money. The latter should not be a big deal if we're only talking about an increase in the short rate (for now) of 100 to 200 basis points (which can occur in steps of 25 basis points each). In the meantime, we're experiencing problems due to the fact that - as indeed the Riksbank and Svensson recognize - that borrowers are suffering from the unanticipated low inflation. In your model, shouldn't the Fed just buy all the outstanding Treasury debt (and just forgive it)? In your model that would produce lots of deflation, but "good" deflation, correct? The model says that, if long Treasuries are indeed worse collateral than short Treasuries, then a floor system (reserves outstanding, and interest paid on reserves at the market rate) is optimal, and the central bank should convert all of the long-term Treasuries into reserves - given the short-term interest rate. Then, the question is - what's the optimal short term interest rate given that policy? There's an implied optimal inflation rate that pops out of the model, but I did not go to much effort to characterize what it is, though there is no presumption that a scarcity of collateral (and a low real rate) implies that the zero lower bound is optimal. It's certainly not true in general that QE produces deflation in the model - just less inflation. An important implication of the model is that the nominal interest rate can be at the zero lower bound and there can be positive inflation - QE or no QE. It shows in February year over year the cpi index rose 1.5%. For March, it only lists preliminary Tokyo results. CPI for the Tokyo area is up 1.3%. The only .4% numbers I see are core year over year for Tokyo area or .4% monthly headline. Maybe there is an error? 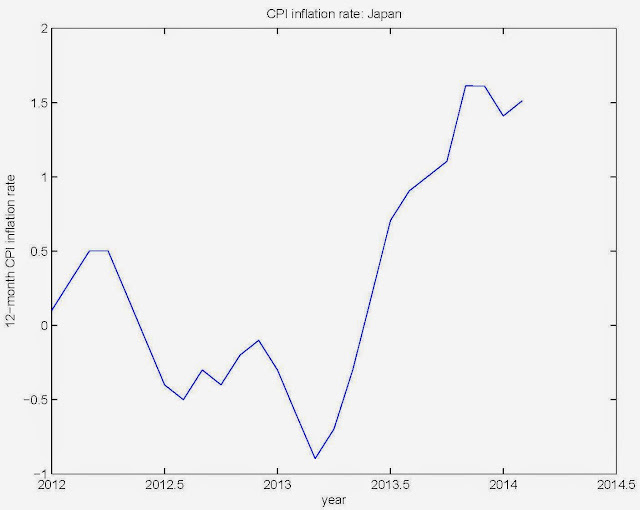 Then, January, February, and March (preliminary) came from the Bank of Japan's web site. here is a direct link to one of the FRED charts that I use in looking at Japan. It includes Japan's unit labor cost, inflation and labor share. You can change the parameters as you wish. (which is the same place I got the 3 observations for this year), the B of J's claim is that the monthly increase in the CPI in March is 0.4%, but you can see that it's actually about -0.9%. The March numbers won't be available until April 30th. The March you see at that site is only for the "Ku-area of Tokyo." So the year over year is against a totally different series. The January and February numbers are from all of Japan. I think you are correct until you put the March data. That data is from a completely different series for Tokyo. That's why the year over year look wrong, they are compared to the rest of the Tokyo series. I see what's going on. Thanks. I'll just scratch the last number, and fix the chart when I get a chance. March inflation came in up a little at 1.6% yoy, Index Value = 101. “Too often economists are trained to look scientific and more scientific than other Social Sciences by in fact using too much complicated math and not going sufficiently after the historical data. You know, when I started as a young AP in a US University [Ed. Note: MIT] I found really striking that everybody was expecting me to prove new mathematical theorems and I realised that we had very little knowledge of the fact we want to explain. Math can be useful if it is simple and allows you to explain a larger number of facts, but if we don’t even know what to explain what’s the point of proving theorems? I think part of it is because it’s an easy way to look scientific. Using a lot of techniques is a way to put off other people and to pretend that what we are doing is really scientific." Economics is indeed a science. We have theory. We have data. We use the data help us with the theory, and we use the theory to help us with the data. Mathematics and statistics are extremely useful for scientists. Economists would be foolish to leave these powerful tools on the shelf. We're not trying to fool anyone. We're doing the hard work of trying to figure out how the world works and make it better. Don't be so cynical. People might just dismiss you as a crank. "Matthew Yglesias: In your book there's a very amusing criticism of American economists and what you call their childish mathematical obsessions. What’s being done wrong? Thomas Piketty: It's not only in US. It's economists everywhere. I think what they're doing wrong is that in order to distinguish themselves from other disciplines, in order to look like we all are scientists, they use too much complicated math just for the sake of it. Math is fine. Math is very cool. But very often, they tend to push for more sophisticated math just to push off other people. It's an easy way to have the appearance of scientificity. For a real mathematician or physicist, the math will not be terribly impressive but it's enough to impress those economics departments that are less good at math and those social scientists who are less good at math. I think math is useful, if you have a good ratio of facts to theory. But most of the time the economists do the opposite. There are incredibly sophisticated mathematical models with a very tiny empirical component. I think this tells you more about Piketty than it does the state of the economics profession. It is funny to see how you always try to pretend in vain that the topic is methodology while it is in fact content. All the people you have an issue with are progressive economists and all the people you defend (like Fama's counterfactual straight-out-of-the-asylum claim that monetary policy is always ineffective) are right-wing economists. Weird isn't it. Some of those "progressive" economists you mention are the last people I would want to be stuck in an elevator with. I never defended Fama though. That's inaccurate. I defended Prescott though. I'm not "pretending" about anything. I am only interested in the science. Really. "I am only interested in the science. Really." I agree with Piketty the obsession with making an argument in algebra which can be expressed well in English is about identity. It is a way of differentiating yourself from the others and forming a club. Good mathematics is good. But it should complement analysis not supplement it - ie use technical appendixes. The more people who can read the research, the more available it is to others working outside the discipline. This is good for research and healthy for democracy. Eg, give an article on Chinese monetary policy to someone who knows Chinese history - and see what they say. They would immediately demolish it for even not knowing the most basic things about its institutions and why they are there. "It's just the Fisher relation. It has to hold in the long run." Aha, doing long-run macro to analyze short-run problems. No wonder you get things so wrong. Rule of thumb: If it shows up in a scatter plot, it's not so long-run as you think.